Been a while since we've had some cargo bike shots. A postal carrier - or rather rider - in the heart of the city. 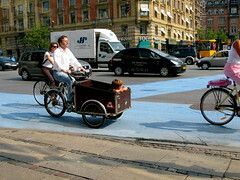 I've seen these cargo bikes at Green Expos here in Vancouver. There aren't too many on the streets yet but I have seen at least one. There is a group just starting up a delivery co-op which will use cargo bikes. I've seen really nice versions of these bikes around Oakland/San Francisco area as well. Very nice custom mades, but not with a janky box on the front. Super legit style, with a nice paint job and everything. They go for high dollar in the shops. Does anyone know where to purchase one on the eastcoast of the USA? on the east coast of the US you can contact The Dutch Bicycle Company out of Boston. they have some cool Danish brands. 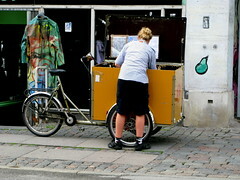 Are you seeing many two-wheeled cargo bikes in Copenhagen? The Xtra Cycle spinoffs are gaining traction here. Thanks Zakkaliciousness. I'll take a look. apart from the 80-odd year old long john design, three-wheelers are the preferred cargo bike style here. there are around ten different brands on the market. 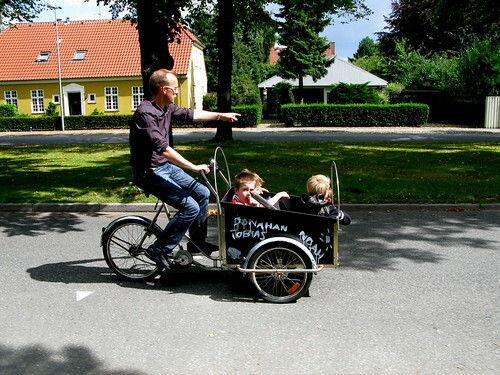 copenhageners prefer three wheels. the two-wheelers have never taken off. 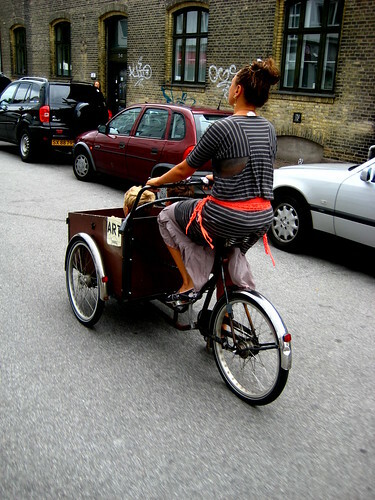 Might I propose, instead of "a carry", "a load" of cargo bikes?